Here's what Dandy Dawgers are saying! I wanted to share these photos with you---the proud graduate, Red, relaxing after his graduation class last night, and his proud Mom (me!) 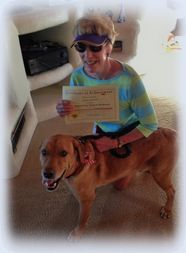 with Red and his special diploma. Thank you for giving us the tools and keys to a new world for our formerly very frightened Red Dog. As you know, he was almost to the point of paralysis, and definitely in a continual state of panic, when he went anywhere outside of our home and neighborhood. Even at home, and at my parents’ house, he’d stay away from everyone but me, and find a nice place to hide. Everyone who knew him BDD (Before Dandy Dawgs) has commented about the drastic change. He’s friendly instead of frightened, he’ll join the family instead of hiding, I can walk him by distractions and he won’t pull me back home, and he’s having so much fun learning his “tricks” and getting all of the praise he deserves. While he’s still not free of those fear demons, he is so far beyond where he was during our first class when he pulled me down your driveway and then spent the rest of the class hiding next to our legs, locked in his state of disassociation (if I ignore you, you don’t exist). I never would have thought that he’d be able to walk around the Prescott Court House without totally freaking out (he only did a little). The first years of Red’s life were very scary---I’m so happy that we can make his remaining years full of fun, food, freedom, praise and petting. That’s what he deserves! If you need a reference as to the magic that you can work with dogs, I’m it! 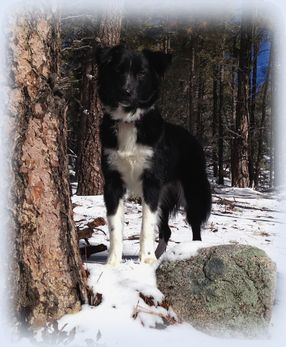 I adopted Bandit from a Border Collie rescue. As he settled into his new life aggression problems (people and dogs) became apparent. 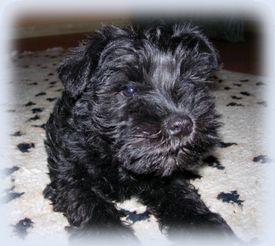 During the first four months I consulted several trainers and completed private obedience lessons. More than one trainer suggested that ”I should return him to the rescue as they have places for dogs like him, and there are too many good dogs out there to keep one like him”. 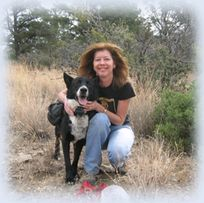 My hope for a good life with Bandit was waning. The silver lining is this led me to Dandy Dawgs. In a sense, Bandit has been rescued again when we started training with Andy. During our first Basics to the Streets class I knew we had found a home, and there was optimism for Bandit and me. Andy gives so much direction, guidance and help in each class-she’s simply outstanding! Her reward based training encourages him to want to please making learning quicker and fun. We are a work in progress and with Andy’s guidance I am sure someday Bandit will be able to enjoy the kind words of a stranger and be less reactive to the world around him. Our training continues with Advanced Obedience and Agility next, and Tails to Trails in the future. With Love, and someday kisses from a future Dandy Dawg! Love you Andy-you make a difference! Andy, you have made my life and relationship with Boone so incredible. Thank you so much for doing what you do and for doing it so well. It is such a huge gift to this world to bring dogs and their owners a similar language in which to communicate. And you are such a gift. Thank you so much for everything. I will definitely keep in touch with you...you are a sister to me. 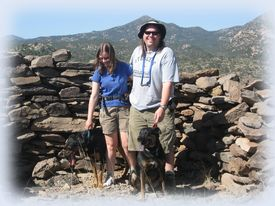 We left Minnesota and its cloudy snowy frigid weather to experience the Prescott area February 2010. We brought with us our 11 month old Miniature Schnauzer, Tommie (Tomasina) who needed some behavior modification. Andy came to our home in Prescott to help us. In less than a few hours we had a greatly improved dog and two owners who realized we were the ones who needed training. 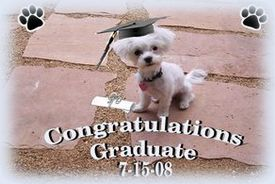 Our wonderful little dog loved to please and would do so if we as owners could master a few behaviors on our part and be consistent with our behaviors. Andy was a most impressive dog trainer. 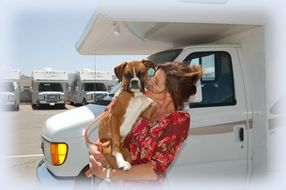 She is gentle, very knowledgeable and can quickly assess the dog's and owner's training needs. She obviously loves what she does and is an excellent communicator with the dog's owners and their dog and gives clear understandable guidance. When she works with you be ready for her good sense of humor as well as her direct guidance to change your behavior for your dog's benefit. Without any hesitation we recommend Andy for your dog training needs. As a result you will have a "dandy dawg" if you can follow through with her superb dog training advice. 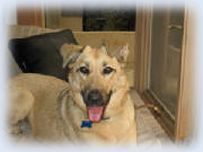 We signed up for your Basics to the Streets class because Suka was poorly socialized with other dogs and he frightened people who came to our house. We have seen such a tremendous change in Suka! We were so happy with the results that we decided to take your Tails to Trails class to reinforce his socialization. I can’t tell you how much it means to see Suka trotting along the trail with other dogs, to see him swimming in a lake with other dogs, to see him relaxing in the shade with other dogs, etc. Suka is much calmer and happier now and I’m more relaxed and happier now. None of that would be possible without you. I am also proud to report that Suka has good manners now when people come to our house. We can be more social now too. Thank you so much for all that you have done for us! I highly recommend Andy Lloyd and her Dandy Dawgs obedience program! Andy not only provides expert obedience instruction, she addresses each student's individual behavioral issues, providing guidance and solutions. 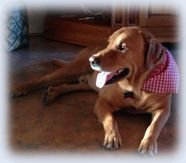 In addition to mastering her basic lessons, my exuberant young Black Lab, Olivia learned to pass through automatic doors, negotiate stairs and other obstacles all while remaining focused and calm when encountering new and unfamiliar situations. 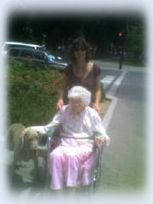 She learned to interact happily with other dogs and people. Olivia and I have both learned so much from Andy. So important for me is the fact that I have learned to have confidence in my ability to provide direction for her. Last, but certainly not least, we had so much fun!!! I am writing to thank you for bringing Nicki into my life and for helping us learn to lead a happy life together. You took Nicki home to foster him when no one thought he was adoptable. The work you did with him was truly amazing, as was your help in training me! When I finally brought him home we were both thrilled, but still a work in progress. Attending your classes with Nicki was a great way to continue our education, and they were very fun for both of us. Nicki and I are definitely enjoying life together. 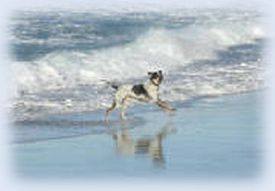 I am including a picture of Nick running on the doggie beach in Carmel. It turns out he loves vacations! I can never thank you enough for being the "guardian angel" who brought us together. My husband and I were extremely impressed with the results we received from the Dandy Dawgs’ puppy training class. Our 3lb, 4-month-old Maltese, was high-spirited with a short attention span. The class made us see how our dog seemed to “fly” on two feet while we took her for a walk. Our pup also had social anxiety that lead to her timid behavior. It is due to the training from Andy that our sweet girl received the honor of Most Improved Puppy. She is now able to walk properly on a leash, sit, stay, lay down, come, leave it and no longer cowers when we come near her. Our relationship with our puppy has grown into one of mutual respect, understanding and sheer love since our training. We plan on continuing her schooling because she truly enjoyed the interaction, praise and the fun she had while attending the sessions. It is with the highest recommendation that we tell our friends to employ Dandy Dawgs as their professional trainer. Your dog will thank you for it! This is my sweet, wild coyote girl Caya. I got her a few months ago through U.A.F. She had a gentle nature but a little wild streak and no training. While enrolled in Dandy Dawgs Basic to the Streets class I learned to teach Caya how to sit-stay, down-stay, leave it and she is learning how to mind on the leash and pay attention to me when there are lots of other distractions around. With repetition at home and the skills Andy is teaching us, Caya is turning out to be a wonderful companion. It is great to see Caya respond so well and quickly to correct body language and commands. I think Andy is amazing with dogs. While we were working our dogs in front of a store a woman came out of the store saying, "Did you see how that dog listened to her?" she was blown away with Andy’s training. I called Andy to get help with my UAF foster dog Shep. 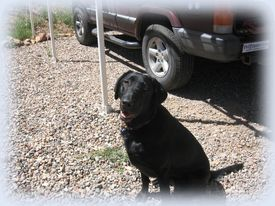 Shep is a rescue that came out of Prescott's Animal Control facility. As so often is the case with rescues he had very little socialization skills. I signed on to take Andy's Tails to Trails class and I am SO glad I did. Shep and I had such a good time.Shep was able to just be a dog with the other dogs yet we still got the structure and training we both needed. I think Andy's training methods make the training experience so much easier, more enjoyable and the results have all been positive. We are currently in her Basics to the Streets class and we are loving this one too! Thanks Andy you are truly amazing!!!!! Wylie was picked up in a puppy mill raid when she was just 8 weeks old. She was taken to Joe Arpaio's jail where she remained until she was 8 months! We saw her at an adoption event and fell in love with her! When we brought her home she had not been exposed to ANYTHING. She did not know what a door was and what to do when it was opened. She didn't know how to walk through the forest as the branches startled her. She certainly was not potty trained. But she takes everything in stride and learns quickly. It only took exposure to things one time and then she was comfortable. 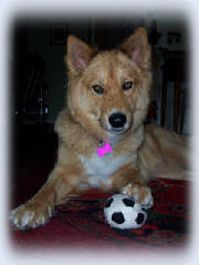 She has a wonderful personality and loves all people and dogs (large and small). Thanks to Andy, she is well trained and is a true joy for her Mom and Dad. Andy's training methods have been so fun and easy! A dog truly blossoms under positive reinforcement! Association of Pet Dog Trainers. Dog trainer Andy Lloyd of Dandy Dawgs offers positive reward based dog training techniques, dog obedience classes, special canine events, spay and neuter education and information, innovative problem dog behavior solutions, private and group dog training classes, along with lots of fun things to do for people and their canine companions in the beautiful Prescott, Arizona area.